Wind Power Archives | Morai Logistics Inc.
On Tuesday, Denmark’s Maersk Tankers announced that it will begin testing the use of special sails, developed by Norsepower, on one of it’s oil tankers. 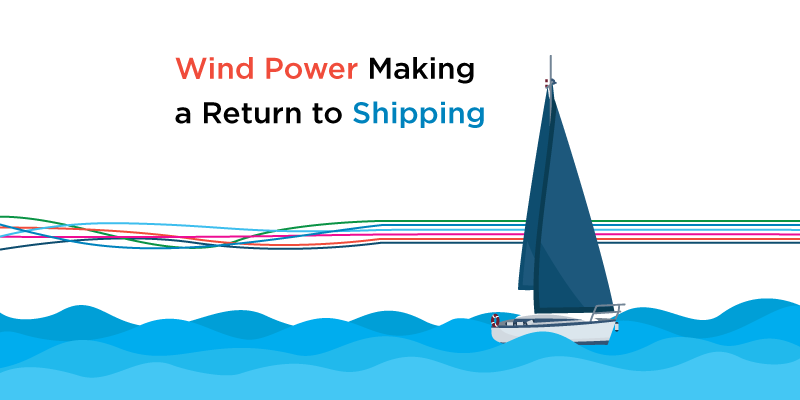 If the technology proves promising, the company could go onto to add them to a further four dozen ships, bringing back wind power to shipping. It isn’t just any old sails that the company will be testing. These sails are special “rotor-sails”, which measure nearly 100 feet tall and look like giant rotating cylinders. This is the latest attempt by the shipping industry to reduce its reliance on fuel and create a sustainable alternative. What makes Maersk’s test different is that the 245—meter tanker will be the biggest object to-date moved with wind power. For the last few years, shipping companies have been trying to find ways to cut marine fuel use. This is because as of 2020, new pollution laws will take effect which will require the use of more expensive, lower sulfate fuel for shippers. Cargill Inc. for example, is exploring the possibility of using a giant kite made of special fibers to tow a vessel with wind power. Solar powered sails are another avenue of renewable energy being looked into by several different companies to combine both wind and solar energy. The basis for Maersk’s innovative technology isn’t new. The sails are an updated version of the rotor created by German engineer Anton Flettner, almost a hundred years ago. At the time, they were too heavy to be effective. Thankfully, these new sails are made from lightweight carbon-composite materials making them much more cost-effective. They harness the wind by using the Magnus effect, the physical force that makes a tennis ball swerve when hit with topspin. A motor sets the cylinders spinning and when wind blows, the airflow speeds up on one side of the sail and slows down on the opposite to create a pressure difference that generates lift, propelling the vessel through the water. The sails have already been tested and installed on a Dutch shipping ferry in 2014. Bore, the company operating the ferry, reported that the results exceeded expectations with up to 6% fuel saved when there’s good wind. The final decision as to whether Maesk Tankers will roll out the wind powered tankers won’t be made until 2019. However, the company’s is very optimistic about how technology will cut fuel costs. About $2.1 billion U.S is spent annually on marine fuel. Maesk expects that price could be cut by 10% with the new sails. Maesk is also hedging it’s bet on the sails by investing in other sustainable alternatives. This includes special paints that go on the hull of a vessel that reduces drag by resisting microorganism and ale colonization. And, specialized delivery drones to replace barges to deliver ship supplies. It’s both strange and heartening to see wind powered propulsion make a return to shipping after its over 100-year absence. Modern innovations technological advancements have made Maesk’s sails, and similar projects possible sustainable solutions to an industry that needs them.